GLASGOW Warriors have confirmed that Ed Kalman, Finlay Gillies and Scott Wight will all leave Scotstoun at the end of the season. The tighthead prop added: “I would like to thank all the staff at Glasgow Warriors for all they have done for me over the years. I would also like to thank all the players I have shared the field with – they have become more than just teammates, they have become my friends. 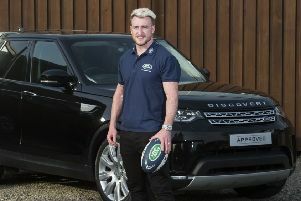 “Having taken a rather unconventional route to professional rugby through Durham and Cambridge University, the idea that I would play even one game of professional rugby seemed implausible, so to have played for over eight years and to have represented my country is beyond anything I could have ever dreamed of. “Coming to play for the Warriors after my time with the Borders was a real homecoming for me. Glasgow is the city I grew up in and call home and to have represented the city and its fans over 100 times is my proudest achievement. Gillies, who came through the Scottish Rugby Elite Development Programme, signed a full-time professional contract in 2012, and has made 24 appearances for Glasgow. Head coach Gregor Townsend thanked the players, adding: “Ed (Kalman) has played a big role at the club in recent years and this season he became one of our centurions. “He has also been in the best form of his career and we’re disappointed for him that he has to retire. We wish him all the very best for the future. “Scott and Finlay have played a lot with Scotland 7s this season and were also key players in our victory at Melrose 7s. They’ve put a lot of work in at training and have contributed to what has been a real squad effort over the last couple of years.